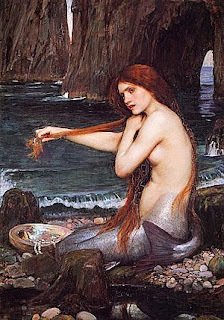 Below is a fairy tale mermaid . Happy reading . It is said that the mermaid named Ariel . He is the God of the Sea princess named Triton . In contrast to the inhabitants of the palace under the sea . Ariel prefers playing in the sea or on the islands empty . While the inhabitants of the palace under the sea rather stay on the ocean floor . So often Ariel to the surface so that his father warned him the god of the sea .
" Ariel , you do not often surface to the sea . " " What's wrong , father ? " asked Ariel .
" Do not tell me you 'll meet people , " said the god of the sea .
" Dad , what is and what man is ? " " Ah ... you're this , you did not know , " murmured Lord of the Sea , " That in the ocean , especially in the mainland there are creatures called humans . " " What they like us , dad ? " " Yes , exactly like us or we are like them , it's just that most people are just evil and selfish. " " What good nonexistent , father ? " " Hmmm ... there also , but only a few people who are good . " " Well , I was curious and wanted to meet people . " " Huh ? Never Ariel ! " Sea god was shocked to hear her wishes .
" Why father ? " " Do not kid, you 'll be damned ! " God of the Sea said earnestly , "You'd better play around under the sea alone . " " Ah ... my father , who would dare to hurt me ? I'm a daughter of a very powerful God of the Sea . Daddy definitely would not stay silent if I harmed humans . " " Ah , you are Ariel ! " That mermaid Ariel is the prettiest of the many mermaids . Ariel age is still very young , only seventeen . Like the flowers that are blooming . One day Ariel sea surface . Incidentally not far from it there is a big ship . On top of the beautiful decks that seem some people were playing music and dancing , suddenly staring at Ariel view of a young man who was sitting watching her friends who were dancing .
" Come on Erik Prince , come dance with us , " asked someone who was dancing .
" Oh , it's a handsome young man called Erik , " Ariel murmured that they peek from under the deck . Suddenly a huge storm came accompanied by heavy rain and lightning were darting and strong winds . Instantly the huge ship adrift like a paper boat alone . Erik Prince and his men tried to keep the ship was not reversed . Greater storms and devastating craze . The ship began to roll . Suddenly lightning mast crazy , " Kraaakkkk ! " and fracture mast override powder keg . Audible explosion . Erik Prince that was near the powder keg was thrown and the waves washed menggelagak .
" Prince ... ! " Ariel yelled the young man's attention earlier. Prince Erik dragged the water , if not quickly helped of course he would have died to the seabed . Ariel fast acting , grabbed Prince Eric and pulled to the surface . While holding Erik Prince , the beautiful mermaid swim to shore . Erik Prince while still unconscious , Ariel tried to remove water from the young man's stomach . Then he stroked the head of Prince Eric . Without realizing it , Ariel is actually interested and in love with Prince Eric . He really wants to be with Prince Eric in the human world . At that time Prince Eric almost unconscious , he had started to open eyes and wonder when a beautiful face and a delicate hand stroked his head . At the same time Ariel hear Erik Prince 's men came .
" I must hurry away before known to man , " Ariel said as she quickly threw herself into the sea . Ariel back to the palace under the sea . He was once cheerful is now turning into a recluse, he often daydream . A few days later , God of the Sea caught her daydreaming , " Well , do not you ... , " his voice suddenly Ariel awaken from my reverie .
" Is what true , Dad ? " " You're starting to be affected by humans , is not it ? " " Beb ... true father . " " Well ... well ... , you must have been exposed to the magic of the man . " " Magic ? There dad , maybe ... maybe I 'm in love . I always wanted to meet and close by his side . " That the Sea Gods will finally understand her situation was falling in love. But look around his half- human half- fish , it is so pessimistic that her son will be able to live with Erik Prince .
" But I have Heirloom Pearl Gods right ? " Ariel said then . God is leading pearl heirloom Sea Gods . Volume there are only three . Sea god gave two to Ariel , one for preparing underwater palace . Pearl first if swallowed useful to transform the body into human mermaid fully intact for two years. Pearls second to raise the dead because of toxicity. After swallowing pearl Ariel first transformed into a beautiful girl and beautiful , then release Ariel Sea Lord to meet Prince Erik . Ariel back to the island to help Prince Erik empty place . At the same time Erik Prince is also in place. "You ... you surely girl to ever help me ?
" How earl know ? " asked Ariel . "I could see your face before you go . Upon returning to the palace could not sleep because I always thought of you and want to meet you. Now ... after we met , I turn to my my wife will you ? " " Oh prince , I'm just a girl herself . Both of my parents are in the ocean . " " You mean your parents dead ? Enough does not matter, let's follow me to the royal palace . " Thus , Ariel finally get married and live happy with Erik Prince . But they got married new year , there is a daughter of jealousy over their happiness . Since old daughter fell in love with Tera Erik Prince . He was not willing that Erik Prince Ariel snapped . Tera one day put poison in food Ariel , but given the poison food stuck eaten by Erik Prince . Erik Prince , then died the young . The whole palace Geger . Ariel is accused of being the killer . "The policy is not clear origins girl , could you kill the man himself ? " Princess Tera attack in front of many people . Ariel now remember the advice his father that the human world is full of violence and defamation . It has now learned that her daughter would like to grab it, but never menggubrisnya Erik Prince . Firmly and loudly , Ariel said , " I am not going to poison my husband . I know who the culprit is . Treat my husband I will do , so that he knows the truth about who poisoned him . " Tera Princess Ariel listened shaking . Ariel does not matter , it entered a second Pearl deity . Then he kiss her face , having satisfied it said , "Farewell my husband , our world was different . I always love you . " Before Prince Erik aware , Ariel was running toward the beach . And there was his father the Sea God was waiting for him with a car, " Come, my boy, we return to our own world . " So touch the ocean , Ariel changing body ceases to be a mermaid .